MT B-Ball Skillz Academy, located in Atlanta, GA is a Non-Profit 501-3(C) organization. Accomplished leaders of today have a responsibility to drop a ladder down for leaders of tomorrow to climb. It is a cliché, but it’s true: "Basketball changes lives." MTBSA seeks to use the power and appeal of basketball to teach at-risk youth valuable life skills, basketball skills, and academic fundamentals. 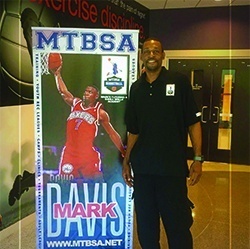 MTBSA's Founder, Mark Davis, a former NBA and international basketball player, works with other professional players to teach kids basketball, health and wellness, athletic development, academic responsibility, and social awareness. The result will be healthy and productive youth equipped with the tools to succeed and navigate difficult situations in basketball and in life. To positively affect the mind, body, and soul of youth and young adults on their journey to become thriving citizens through mentoring and team-building programs. MTBSA will continue to develop a brand that emphasizes its curriculum that weaves together cutting-edge training methods with industry-leading information designed to cultivate better, stronger, and faster student-athletes. The organization’s marketing efforts will continue to highlight MTBSA’s commitment to creating leaders, decreasing crime, promoting health, and increasing social awareness in its community. We service youth from ages 6-16 throughout the Metropolitan Atlanta. The fabric of our curriculum is woven together utilizing cutting-edge training methods and industry-leading information designed to cultivate better, stronger and faster student-athletes. Mark Davis is a native of Thibodaux, LA, where he developed his passion for basketball. Mark was a 1991 graduate of Thibodaux High, where he garnered titles of All Parrish, All District, All State, and All American. Mark has almost three decades of basketball playing and training experience. Mark was blessed to have played basketball at the highest level possible. His 14-year professional career includes time as an NBA player among other leagues. As a small forward, Mark attended Howard College in Big Spring, Texas, and Texas Tech University before being selected by the Minnesota Timberwolves in the 1995 NBA Draft. He also spent time with the Philadelphia 76ers, Miami Heat, and Golden State Warriors. After retiring from the NBA, Mark spent several years playing professionally as an international player. Mark has been mentored and coached by basketball greats like Pat Riley and Larry Brown, whom he credits his tough, but effective, coaching style. In 2011, Mark embarked on giving back to the community by founding Mark's Tutoring & B-ball Skillz Academy (MTBSA) in Atlanta, GA.
Affectionately referred to as “Coach Mark”, he is very hands-on within the organization. His major area of focus is player development. Dubbed by some as the “Shot Doctor”, Coach Mark offers individual training Monday to Friday, specializing in shooting, defensive skills, and ball handling.